With Thanksgiving right around the corner, it’s time to (reluctantly) get your kitchen ready for the mass baking that is sure to ensue. The holidays for my family mean mass quantities of food and over 20 dozen kinds of cookies. As I prep for the gluttonous holiday season, there’s no task more important than making sure my kitchen is ready. That means saying goodbye to the grill and margarita blender and making room for my Kitchen Aid, five pounds of flour, measuring cups, Christmas cookie cutters, handheld blenders and turkey roaster! The key to a successful holiday season lies in organization! There’s nothing more stressful than trying to find your roasting pan in your cupboard of thousands of pans as the turkey defrosts in the sink or dig through a cluttered pantry trying to find flour on a cookie deadline. Instead of the chaos that comes with holiday cooking, stay sane this year by following these key kitchen organization tips! My pantry used to be a nightmare. There was, literally, stuff everywhere. I had 3 packages of 1/4 full flour, sugar spilled everywhere and random soups and spices mixed in with the chocolate chips. I finally had it and spent an hour completely rearranging my entire baking pantry. 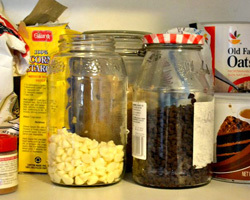 A great way to organize is to pour your flour, sugar, chocolate chips, etc. into canisters or old jelly jars and label them. Makes it much easier to spot what you have! Whether you are whipping up pies for your Thanksgiving feast or baking hundreds of cookies for your child’s school, these next two months are busy with baking. To make your life easier, keep your high use appliances (the ones you use when you bake) out on the counter or in an easily accessible place. 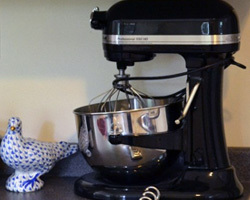 From November to December, my Kitchen Aid mixer sits on my counter and my bags of flour are on their own shelf. Keeping things where you can see them or easily grab them makes your life easier — for baking and the clean up! 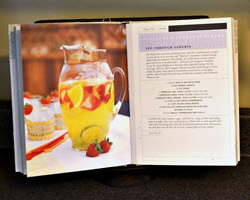 Although I don’t use cookbooks, the stand I got as a wedding present has easily become my best friend in the kitchen. I place my written recipes, phone or print outs there so I can easily follow along as I’m chopping, whipping and stirring. If you are anything like I am in the kitchen, your entire surface is covered in flour, oil, butter and the like about 10 minutes into making a recipe. Keep your recipes, cookbooks and electronics safe by putting them on a stand. Some of my recipes are passed down from family and the last thing I want to do is have them ruined by oil or butter! When you have as much baking and cooking as I do on the horizon, decorations can quickly get in the way. If you want to spruce up your kitchen for the holidays, add some fern garland to your windowsill or hang mistletoe from an arch. Keep decorations off the counters and away from the pantry. Another great and fun way to decorate this holiday is to show off what you made! Get a festive cake or pie plate and show off those delicious baked goods you spent all day making! 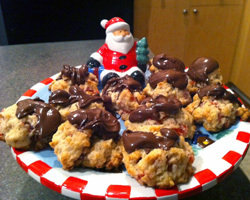 Don’t let holiday baking or cooking stress you out this year. If worse comes to worse, buy cookies and pies and just tell people they’re homemade.